metabolites in response to abiotic and biotic stress. The InducTomE project aims to identify abiotic stress treatments to induce the accumulation of two secondary metabolites (rutin and solanesol) in green tomato residues to high amounts. A conceptual process design will be developed for an extraction process and emerging value chains will be evaluated together with their economic feasibility. In addition, co-induced secondary metabolites will be identified and their market entry potential will be evaluated. 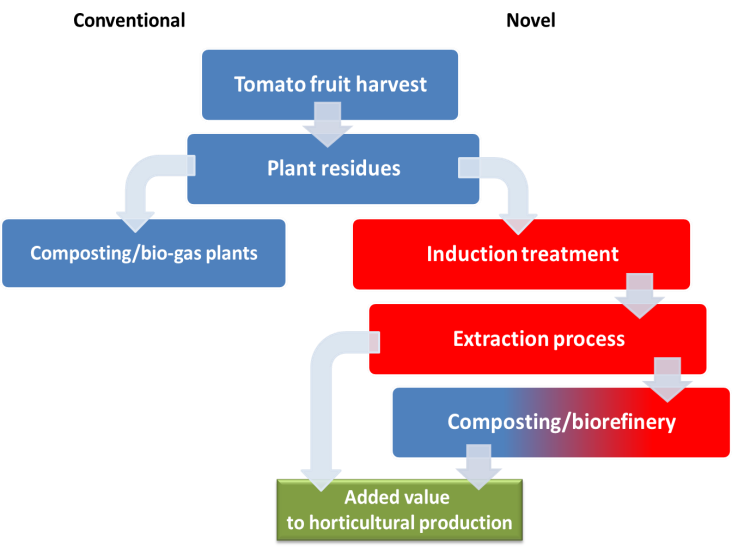 InducTomE generates added value to food crop production by utilizing horticultural waste for extraction of secondary metabolites. As a long-term prospect, the developed process concept will be transferable to other waste streams and metabolites, thereby playing a pivotal role in the successful development of a bio-economy perspective. Suitable abiotic treatments for the induction of the target metabolites in tomato will be identified. Selected treatments will be applied to plants under greenhouse conditions and the physiological response will be analysed. The tomato plants will be screened for additional secondary metabolites induced by the most suitable abiotic treatments and the respective biosynthetic pathways will be identified. A technical separation process of the target metabolites of stress treated tomato biomass consisting of pre-treatment of the raw material, solid-phase extraction and purification will be developed. Moreover, the production and capital costs of the downstream processing and the emerging value chains and market potentials will be analysed. The total budget of InducTomE is € 668.693. InducTomE is part of the NRW-Strategieprojekt BioSC and thus funded by the Ministry of Innovation, Science and Research of the German State of North Rhine-Westphalia. Hoffmann, AM, Noga, G and Hunsche, M (2016). Alternating high and low intensity of blue light affects psii photochemistry and raises the contents of carotenoids and anthocyanins in pepper leaves. Plant Growth Regulation 79(3): 275-285.